Last year we caught up with Elton John (The Godfather of the Gay Mafia, according to Will & Grace) and husband David Furnish to honor them both in the Out100 (see the exclusive shot of them in their fab London home/art gallery), but the pop maestro hasn't released a studio album since 2006. All we've had to live on is Moulin Rouge, old albums on repeat, and YouTube videos. Life is really hard. So with the release of Diving Board tomorrow, we thought we'd compile 11 of our favorite Elton moments to share (we're sure you have your own preferred "Candle in the Wind" vid, which is it?). If only all of our vacations were like this: hanging out in the South of France with hot beachgoers covered in body paint, wearing bright-colored suits, dancing with canes, all that fun stuff. And we sincerely appreciate that the men are basically wearing the same small bathing suits that the women are. He's no fan of Madge, and he makes it publicly known, calling her out for lip syncing (an aside the interviewer neatly avoids). He even declared in 2012 her career completely over. Oh well, we can't all be best friends. So, he would never perform at the Superbowl itself, but he was down to star in a lavish medieval court-style "commercial" aka music video for X-Factor USA winner Melanie Amaro. He may be playing a tyrant who won't share the Pepsi, but those platforms kind of make up for any character flaws. Eminem hasn't aways done a good job respecting the LGBTQ community, but he tried to clean up his public image by performing with Elton at the Grammys in 2006. Whether Eminem as a pro-gay or even tolerant public figure is still dubious, but the performance was undoubtedly notable for both artists and the discourse between the rap and hip-hop community and LGBTQ issues. 7. RuPaul and Elton sing "Don't Go Breaking My Heart"
The fact that this video exists may also be a sign that God also does exist. Gay-ified "American Gothic?" Channeling Marie Antoinette? Yes please. We're also trying to buy those candy hearts, wherever they are in '90s ether. 6. Elton on Andy Williams, "Your Song"
Go ahead—try not to cry. We dare you. Dame Edna pretty much steals this interview, but we're ok with that. Elton's as much in awe of her as we are. 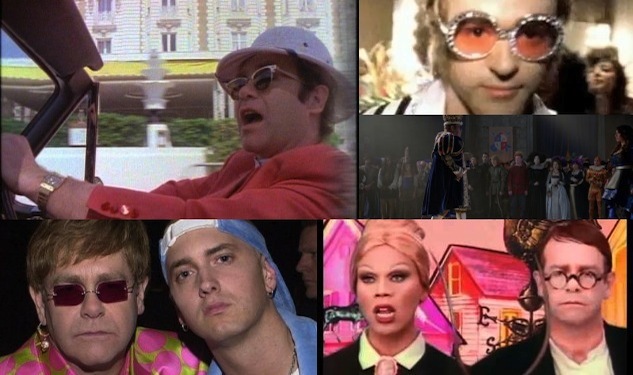 No one would ever have thought Justin Timberlake the logical person to portray Elton, but it works oh so well. In a fabulous striped ensemble and bejeweled glasses. It's a sincere rendition of "This Train Don't Stop There Anymore," tempered with a Pee-Wee Herman appearance. For some reason, this one doesn't make us cry as much, but definitely still a little bit. We can't help it. That song makes everything beautiful, regardless of costumes. This is an obscure one, but a goodie. Elton isn't in the video, which is instead a small film about a teenager's crush on another boy at school (an all boys' school, naturally) only causes him shame and despair. Oh, we know your pain. Again with the tears. This "Crocodile Rock" scene has inspired multitudes of imitators. Just ask Cee-Lo.